Wouldn’t it be great if you could visit Vegas and look like a baller without emptying your pockets or counting cards? Actually, that is not as far-fetched as it sounds. We spoke to Vegas expert and cofounder of Hotels.com and Getaroom.com, Bob Diener, to get the inside scoop on going from rookie to rockstar overnight, without breaking the bank. Real VIPs hit the hot clubs Sunday through Thursday nights because they know they will have the place to themselves. To set yourself apart from the crowd (and avoid long lines and hefty cover charges) Diener suggests following suit and visiting on these days too. If you are interested in one particular nightclub, he recommends staying at the hotel where that club is located and asking for line passes which will allow to you finally walk right past those intimidating bouncers. Another way to score free drinks and easy access? Do some research to find local promoters for the clubs you have your eye on and see if you can get on their list. Ever see Double 007 saunter up to the tables in a tee shirt and a pair of jeans? Of course not! According to Diener, “dressing the part is an important first step towards fitting in with the high rollers.” While you don’t need to spend thousands on a new suit, quality shoes and a quality, well-fitting jacket are a must. Wrinkles, scuffs, and haphazard tucking will give you away immediately. Other helpful additions include a new haircut, a little hair gel, a bit of color that doesn’t throw off the entire outfit, a good watch, and confidence, of course. “While there is no way to fake playing $10,000 a hand in Baccarat when you only have a grand in your wallet, it is possible to blend in with the casino’s highest playing clients,” assures Diener. The first thing is to make sure you understand the rules and the best bets of the game before you ever sit down at the table. “Many of the highest rollers enjoy table games like craps which employ a lot of lingo, and if you don’t understand the basic rules and etiquette for each game, you’re going to immediately stand out,” Diener warns. So getting a thorough grasp of the game will help you rise above the beginner masses. You also want to be sure to conceal your anger if you lose a couple of hands; if you Hulk out over a measly $500, then it’s pretty clear you aren’t ready to roll with the big boys yet. If you are going to splurge on anything, it should be tips. Diener notes that at the tables, a high roller on a hot streak will tip the dealer and waitresses frequently in order to keep the “gambling karma” going. And at the clubs, walking up to the bouncer with cash (and a few pretty ladies on your arm) will definitely help get you VIP treatment. Don’t assume your wallet is secure outside of the casinos—taxi drivers will often take roundabout routes in order to add more miles to the meter. Knowing the best route before you get into a cab is a good way of avoiding wasted money. Do some research to find the games with the lowest “house edge,” aka the lowest likely loss over the long term. “Some common rip-off games include Keno, the Big Wheel, and many of the sucker bets on the craps table. 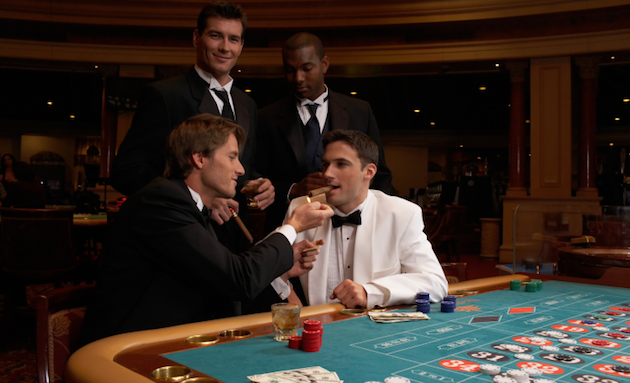 Stick to Blackjack, simple craps bets, and video Poker for good odds,” warns Diener. Lastly, don’t fall for the people trying to sell you “club passes.” The cost of club entry is usually cheaper than these passes so walk on by before you get burned.